A Mechanical Summer: Part 7- It’s Alive!!!! All I can say is wow! It works- it’s alive!!!!! I have 16 vertebrae and 8 are moving precisely like they are supposed to! Stage 1 of the tentacle- from the tip to vertebrae 9 is moving and curling. However, for some reason, stage 2 is barely moving. Current working theory is that the brake cable housing I am using is too stiff to allow the stage 2 mechanism to move at all. I may have to make another base plate that has no large passage holes and screw all the brake cable housings into that so that the bare cable is running through the passage holes of the actual tentacle. I am still waiting for more set screws to arrive so I can finish attaching all the vertebrae and the tail tip. 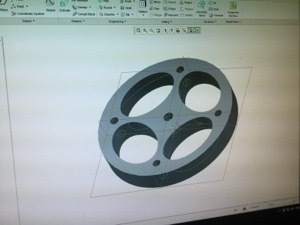 While I am waiting, I have started designing the next mechanism!!! I have started assembling the tentacle! After printing one of the vertebrae, I held it up to a puppet that it could be used for, and I found that the diameter of the vertebrae was too wide. So I reduced the diameter on the original model to 1.5 inches, reconverted it to metric and printed 12 vertebrae. For the tip, base and vertebrae 8 & 9, where the cable housing had to be inserted or the cables terminated, I had to adjust the design so that the holes were 4mm in diameter. 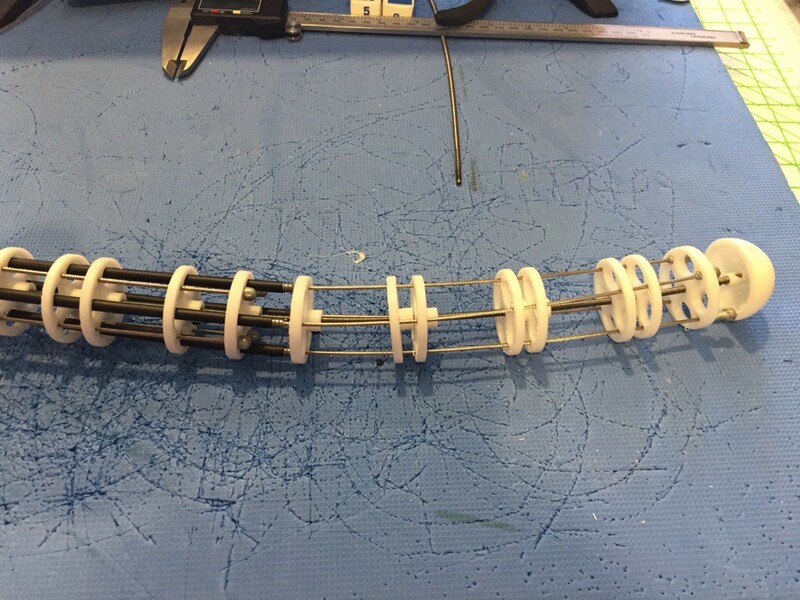 Each vertebrae holds onto the central speedometer cable using a 10/32 by 0.25″ set screw. I had the drill and tap each hole to be able to thread the set screws. I am now waiting for more set screws to arrive, then, I will be able to thread through the outer cables and hopefully this tentacle will start moving! 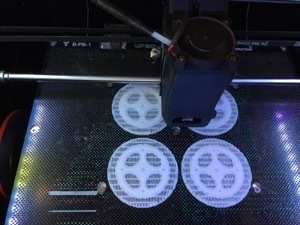 Today I tried to print the first of the vertebrae. When I imported the design into the UP Studio software, the vertebrae appeared incredibly small. 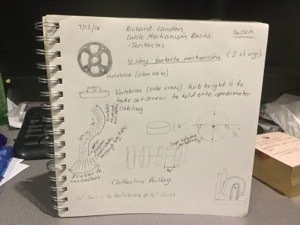 I designed the vertebrae to be 1.75 inches in diameter and the main ring is 0.25 inches high, but in the UP Studio software, the design was 1.75mm wide! I consulted with a more experienced colleague of mine and together, we discovered the problem. UP Studio software cannot distinguish between imperial and metric measurements. It can only read in metric, so when I imported my design in imperial measurement of 1.75 inches, it read it as 1.75mm. I had to convert the design parameters to millimetres in the software I use to design 3D objects and then re-import the file into UP Studio. 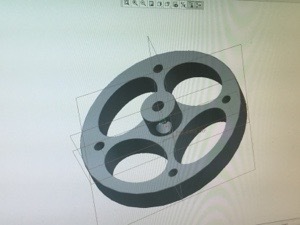 Finally the design could be printed! I had a much more successful day today, finding the brake cable I need. I ended up going to Clarence Street Cyclery in Sydney where they had both the brake cable and the cable housing! I was really impressed with their service and amused at when they asked me what kind of bike I needed the cable for, and when I said it’s not for a bike, they were very confused. Now that I have all the cables, I am almost ready to start construction. All that I need to do now is order the set screws for each of the vertebrae and 3D print the first test vertebrae so I can test my concepts. I have had mixed success finding the necessary hardware for the tentacle mechanism. 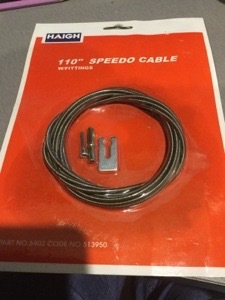 I was able to get the speedometer cable for the tentacle core at a car parts and accessories store in my area, but finding the bicycle break cable has proven to be impossible as there are no bike repair shops in my neighbourhood. 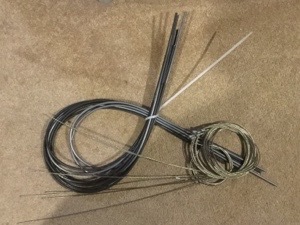 I have one break cable in my collection of puppet parts that I can use, but to make the whole tentacle I need seven more. I have found a bicycle repair shop in Sydney CBD that I will try, otherwise I might have to look online. Now that I have the speedometer cable and one of the bicycle break cables, I have started 3D designing the vertebrae. I started by designing a disc that had the holes for the cables marked. Next, I designed the oval passage holes to pull the first stage of cables through the second stage. At the moment, I have two concerns. Firstly, the vertebrae feels too thick dimensionally. The pieces need to be 1/4 inch thick maximum. My second concern is making the passage hole for the set screw that will hold the vertebrae on the core cable. At the moment, the hole is not passing through the stem properly. It could be because the size of the hole is wrong, or the stem is the wrong size. I won’t know how to solve these issues until I 3D print at least 2 of the vertebrae and test fit them into a tentacle. While I was watching the full tutorial on designing and making tentacles from Stan Winston School of Character Arts, I took some notes on how I might proceed to make my cat’s tail tentacle mechanism. 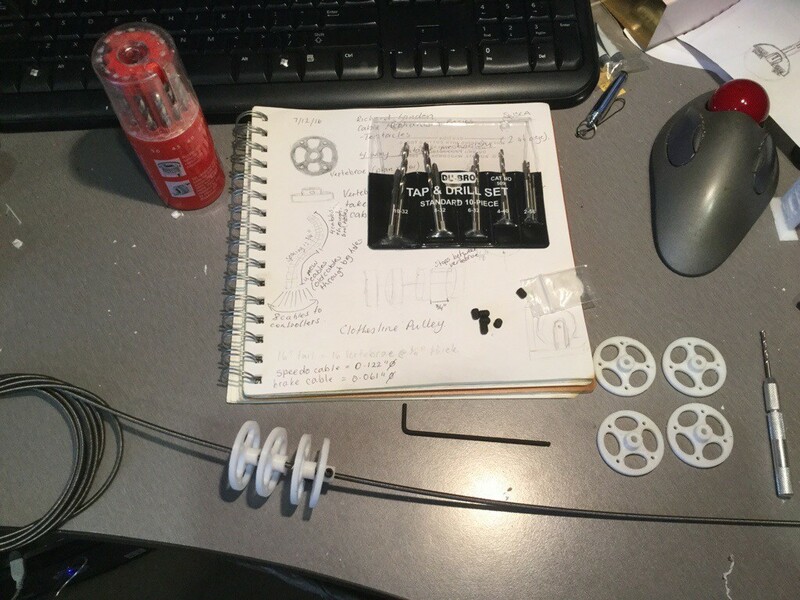 So now I begin the process of sourcing all the hardware required to make the tentacle mechanism. I have to get the hardware first, before I can start modelling and 3D printing the vertebrae. 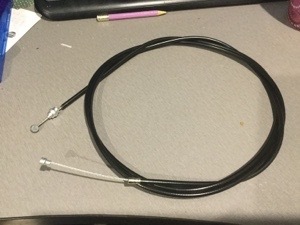 Fortunately, a colleague of mine, made a fantastic suggestion about using bicycle brake cables for the main cables as the cables come with their own housings. So it is off to Autobarn tomorrow to get the speedometer cable I need for the central shaft of the tail, then I need to find a bike repair shop to get the brake cables I need. I still have to source a few parts like the 16 set screws online but if I can find all the cables on the weekend, I can start 3D designing the vertebrae! I am about to start my summer school vacation. 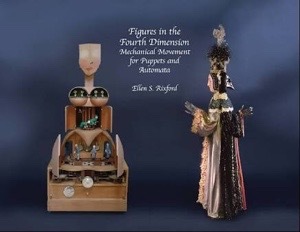 It has been a challenging year for me teaching and puppetry wise, but now that the year is almost over, I have some time to persue a few of my goals in learning more about mechanical design in puppets. I have three goals in mind; 1. Design and make a cat’s tail using a cable mechanism, 2. Design and make a rotating eye mechanism, 3. Design and make a sliding control mechanism for blinking eyes. All of these mechanisms already exist in the world but, for me, making them myself will give me an opportunity to explore these shapes and movements and challenge my 3D printing and design experience. This is going to be an interesting summer!